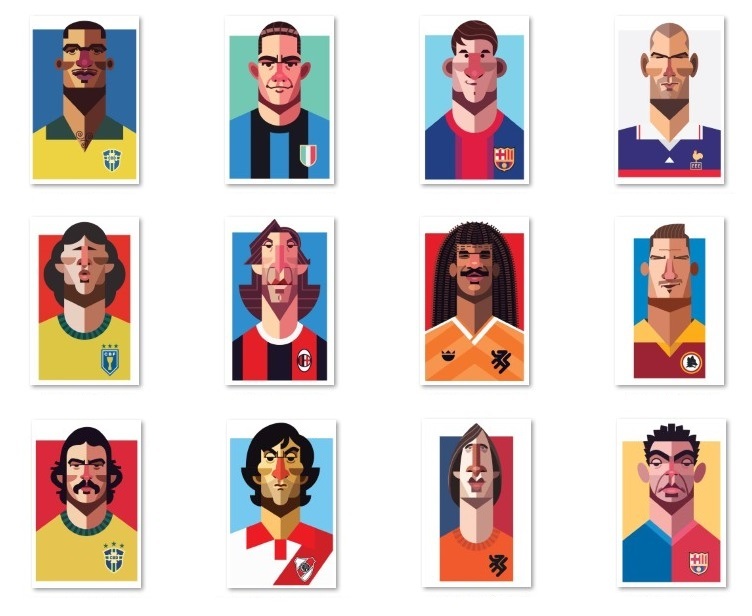 This is a collection of artist and t-shirt designer Dani Nyari’s designs based on soccer — or “football” players portraits. Nyari has a very bright, clear, but interesting-because-it’s-somewhat-obscured-in-style style. He does lots of subject, including products — he’s worked with a lot of companies you would recognize. Who are soccer “playmakers”? Well, Nyari defines them this way to all the sports fans who might be seeing his work for the first time: “A player in football who leads attacks or brings other players on the same side into a position from which they could score. He often plays centrally between the opposition’s defence & attack. He has also been known as a trequartista, regista, enganche, meia-armadror, meia-de-ligação, fantasisti, rifinitore, or false nine depending on cultural origin and/or position.” Soccer sports fans, what do you define a “playmaker” as in your sport? How many of these famous sports celebrity faces can you name? I’ll also point you towards the work of Nyari (click here) and his t-shirt (not only t-shirts though, but bags, pillows and more) designs (click here). Next Article How Many Football Teams Can You Name?